When it comes to pursuing your dreams and reaching your goals are you someone who hustles to make it happen? In my experience, hustling usually resembles pouring my heart and soul into something leading me to neglect other important aspects of my life throwing it completely out of balance. Can you relate? To be honest, that’s how I still operate from time to time. 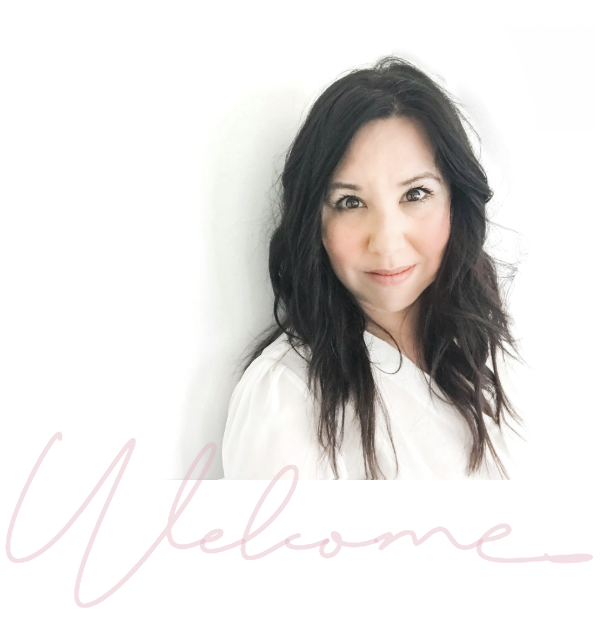 When I launched my first coaching program in March of last year I was working incredibly long hours to try and create content and resources that would help my clients succeed. I worked this way for months. I would wake up early to work and go to bed late to…well…continue working. It was more stressful than it was enjoyable and looking back I can see how I wasn’t producing my BEST work. 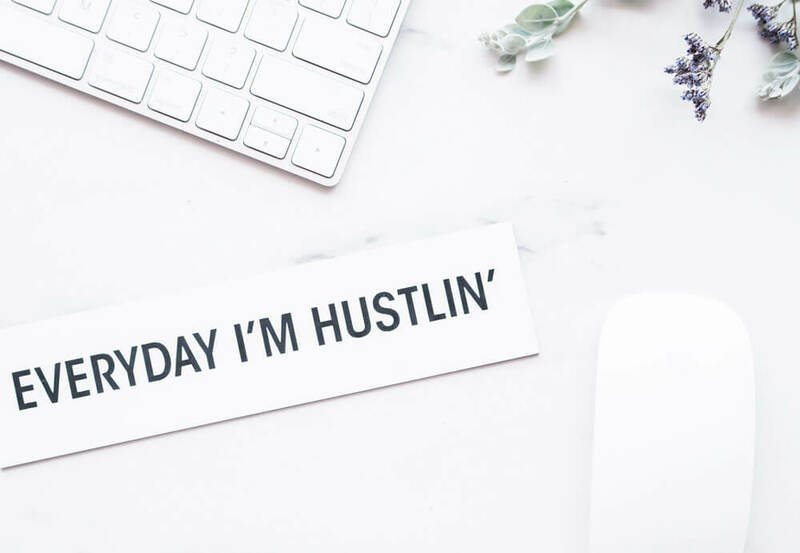 Hustling in my case often meant skipping meals, sacrificing sleep, relationships, fun, play and any other thing that was remotely important to me. I sacrificed the things I love in order to do what I love. Things that should never be negotiable. But, like so many of us, I believed that in order to build a business and create the freedom-based lifestyle I dreamed of having I needed to put all my energy into that one thing. I would tell myself that once I achieved this goal or that goal THEN I could rest, relax, hang with friends, go see a movie, make time for hobbies, exercise, eat better, have a little fun and finally enjoy some (guilt-free) downtime. But until then…just hunker down and hustle, right? That mentality and method for achieving my goals eventually broke me. Although I was doing what I loved, I wasn’t enjoying the process and I barely looked up from my laptop long enough to truly appreciate it. Is that success? I don’t think so. If it is, do I really want it? Hell to the N-O. However, I think as aspiring creative entrepreneurs, bloggers, coaches, healers and change-makers it’s easy to slip into the hustling habit of achieving goals because that’s what we’ve been told to do and our desire to make a difference is so damn important to us. Then we get stuck comparing ourselves to others who are doing what we want to be doing who are doing it better and faster. That self-imposed kind of pressure had me believing that the only way I’d reach success was to hustle even at the expense of my health, my friendships and my family. But, then it hit me. I had been following someone else’s idea of success and methods for achieving it. I began to think about what success means to me and realized that I needed a new approach for reaching my goals and aspirations, a more balanced approach that encompasses all of the important aspects of my life—not just one or two. I’m talking about a holistic approach. The holistic approach means that you follow your own path—at your own pace (even if that means you’re doing it slower than most). It means that you choose to live happy now instead of waiting until you hit your next milestone. You take inspired action and move forward mindfully without trying to force an outcome. You focus and commit to projects while keeping your balance in check. BUT what it doesn’t mean is that you lose your drive. 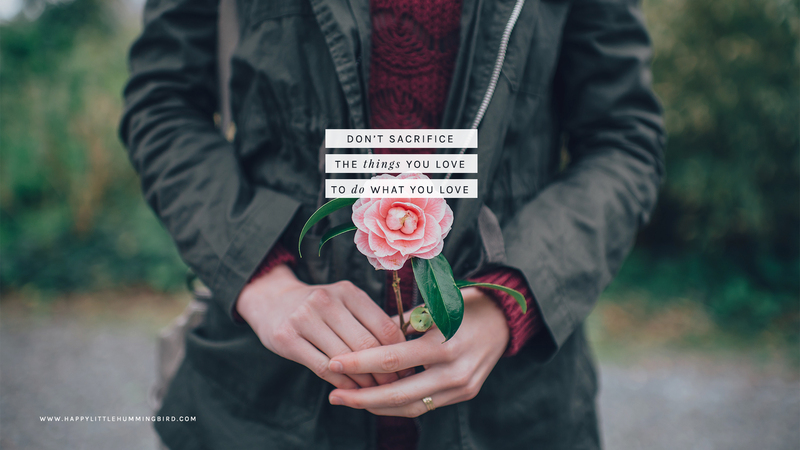 You still have a strong dedication, focus and commitment to your goals, dreams and your creative pursuits but you don’t sacrifice joy, love or the present moment to get there. That’s because you believe that doing what you love is important; following your dream is important; having a hobby that fuels your creative spirit is important; but getting there first is not. You and I know that true success (the kind we’re looking for) doesn’t include a thriving business but a failing marriage; twenty paying clients but not one true friend; or an overflowing bank account but no time to enjoy it. 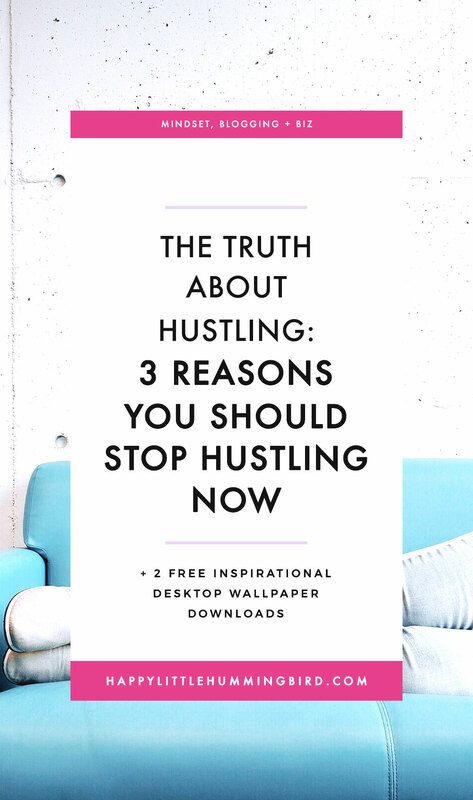 I hope I’ve inspired you to join me in taking the holistic approach over the hustle approach when it comes to pursuing what you want, but in case you still need a little convincing, below are 3 important reasons you should stop hustling now and why it’s detrimental to your longterm success. Hustling as described by dictionary.com is to push or force one’s way which doesn’t sound easy, does it? The more we get into a vibrational flow and stop resisting what is and wishing for something different I wholeheartedly believe that is when and where the magic happens. Mindfully choose actions that propel you toward the life you want without forcing a specific outcome to occur. Don’t expend valuable energy to do so—energy that would be better spent nurturing other important aspects of your life that matter. Remember, if something is meant to happen for your highest good it will happen if you’ve taken intentional steps to make it so. If it doesn’t work out, then assume the timing isn’t right or that opportunity isn’t meant for you right now. Life is so much easier when we go with the flow and just follow the current, dontcha think? Sure there will be times in life we need to hustle and devote extra time to special projects to get things done, but for longterm success, it’s not a sustainable approach (in life or biz) and will rob you of your joy in the process. Hustling eventually leads to burnout and will start to feel pretty empty because you’re not slowing down long enough to enjoy the journey (which is always the most exciting part). 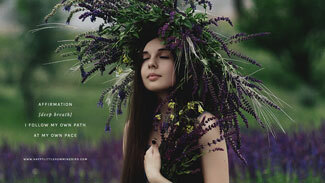 Inspiration and creativity thrive in a well nourished mind, body, spirit and space. You might feel a burst of inspiration and need to do a little hustling to give birth to your new idea, but that doesn’t last long and before you know it your ideas dry up and you’re no further ahead. Take breaks, get adequate sleep, go outside, do things you love, see people you love, have fun, play, create something for the helluvit and you’ll be amazed with the flood of creativity you’ll receive. I hope you’re ready to embrace the holistic approach and ditch the hustle because your happiness matters now. Click an image below for your inspirational desktop wallpaper instant download. Does this resonate with you? If so, tell me how. Are you stuck in a hustling habit and it’s got you hating your life? Do you ever wonder, if this is my dream then where is the joy? It’s so important to learn to let it go… Insightful post, thanks! I love this! Takes a lot Of courage To go at the beat of yOur own druM. I Know most people tend to Gauge their successes on Someone else’s measuring stick and then realize tHeY’re not happy when they Reach thEir goal.But to realize we all have our own joUrney and to trust in our own happiness and to take our time without sacrificing the positive things in our life…..that’s a nOn-hustling appROach. greAt remindEr hlh! I so appreciated this article. I have blogged for years, but have just recently launched my blog a Lovely Pursuit as a more dedicated and intentional space to speak on all things gratitude/wellness/creativity (etc). I have done EVERYTHING you said. I work my 9-5 and then go home to work again, and wake up and work again before going back to work. I’ve noticed I’ve had less inspiration and more anxiety since doing this and have somewhat stepped back to refresh and figure out a healthy balance. This was super helpful. Definitely appreciate the content you provide in this space!